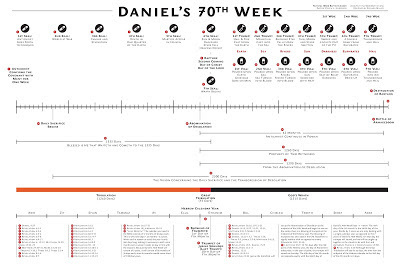 Daniel's Seventieth Week Chart including the tribulation, the Abomination of Desolation, the rapture, the wrath of God, Armageddon, and a tie in with the harvest feasts of Leviticus 23 and the year of Jubile from Leviticus 25. 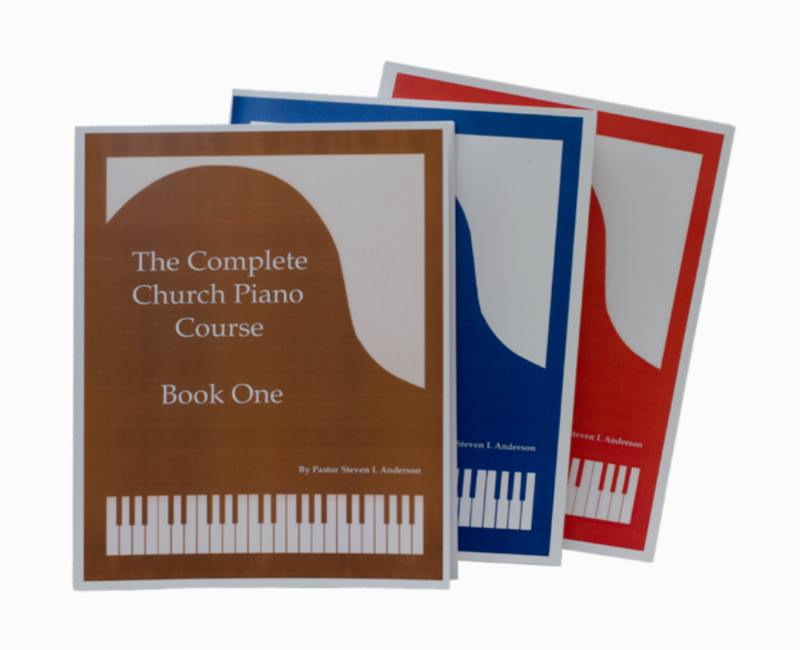 Doctrinal Design by Pastor Steven L Anderson. Graphic Design by Richard Miller. 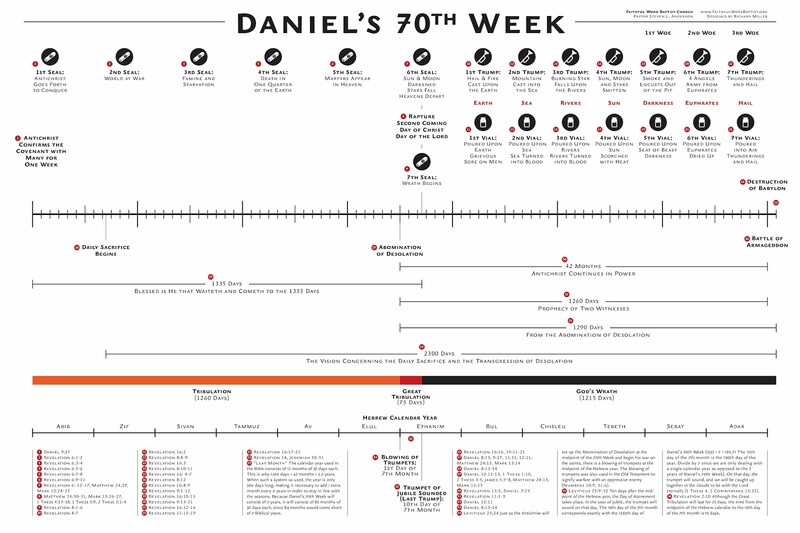 A pdf of the chart is available here. It is designed to be 36" x 24" but can also be printed smaller. You are right on your interpretations, pre-trib Rapture is most likely false, if for no other reason than the Bible says we will all suffer for our faith. But more importantly I believe the last trumpet is the seventh trumpet of Revelation and every symbolism near to that event points to it. I am concerned a bit for you that you have made such strong statements about the Law and seem to have been confounded by gay activists in the matter. The Law is done away with in Christ except that the righteous requirement be fulfilled in us. It is fulfilled through love, a love shed abroad in our hearts by the Holy Spirit when we came to believe. Without love, even for the vilest sinner, our stand against sin is but in our own strength. I also pray that you would avoid the snare of the pseudo-counter culture of men like Alex Jones, who, though apparently well meaning does not understand grace and appears to be more interested in selling things than admitting his own personal need for Jesus Christ. The Left Behind Series is wrong in many ways, but if we look at how the Tribulation Force is described there are many aspects of truth. We will not be able to resist the Antichrist unless we have a greater power living within us. Alex is right that most of the elites understand the world correctly, the real power in life is spiritual not temporal. May The Lord bless you with great insight and courage as the days unfold. How come you place the appearance of the Two Witnesses in the 2nd half of the 7 year period? I see NO scriptural evidence whatsoever to come to that conclusion! I mean, the job of the Witnesses is to prophecy and thus WARN people (besides the plagues pf course). The purpose of prophecy has mainly been warning in scripture. Why would anyone need prophecy and warning AFTER Christ himself has come to earth? It would make a LOT more sense to place them shortly before the Antichrist seats himself in the temple in Jerusalem and proclaims himself God amd THEN Christ returns shortly after. "And when they shall have finished their testimony, the beast that ascendeth out of the bottomless pit shall make war against them, and shall overcome them, and kill them." It says that the beast that "ascendeth"(present tense) will make war with the Witnesses and kill them. It does not say that the beast has already ascended out of the pit. The antichrist can obviously not come to power in Jerusalem if these two guys are prophecising and striking the earth with plagues. He will HATE them and see them as his biggest obstacle in his plan to rule the world and proclaim himself God. 1. The Two Witnesses prophesy for 3,5 years while the Beast "ascendeth" out of the pit in the FIRST half of the 7 year period. UNK: How come you place the appearance of the Two Witnesses in the 2nd half of the 7 year period? MK: IMHO it makes perfect sense that God would send the two witnesses AFTER the saints are resurrected along with the 144,000 male virgin Jews to evangelize the Earth, esp. to reach out one last time to the Jews. UNK: I mean, the job of the Witnesses is to prophecy and thus WARN people (besides the plagues pf course). The purpose of prophecy has mainly been warning in scripture. Why would anyone need prophecy and warning AFTER Christ himself has come to earth? MK: Prophecy does not mean to warn, it is to proclaim the gospel. UNK: It would make a LOT more sense to place them shortly before the Antichrist seats himself in the temple in Jerusalem and proclaims himself God and THEN Christ returns shortly after. MK: No, because the saints would be here to witness. UNK: The antichrist can obviously not come to power in Jerusalem if these two guys are prophecising and striking the earth with plagues. MK: The anti-christ is first. He murders the saints and then the WRATH of God comes. The trib is over when the saints are resurrected. 3 1/2 yrs. The trib is the TRIBULATION OF THE SAINTS. It is not 7 years, no where does it say it's 7 yrs. How do I get the PDF for this phrophesy chart? How do I get the PDF for your chart?